The Jaguars anticipate that Fournette (hamstring) will be ready to play Nov. 11 against the Colts following the team's Week 9 bye, Adam Schefter of ESPN reports. Fournette (hamstring) has been ruled out of Sunday's game against the Eagles, Phillip Heilman of the Florida Union-Times reports. Analysis: This news was fully expected as Fournette will now officially miss his sixth game of the season. T.J. Yeldon has filled in admirably during Fournette's extended absence, but Yeldon's workload could take a hit this Sunday as the Jaguars work the newly-acquired Carlos Hyde into the mix. Fournette (hamstring) is not in line to play Sunday against the Eagles, Daniel Popper of The Athletic reports. Analysis: This will mark Fournette's sixth missed game of the season as he continues to recover from a lingering hamstring injury. T.J. Yeldon and the newly-acquired Carlos Hyde are expected to see the majority of work out of the backfield during the 23-year-old's continued absence. Fournette (hamstring) remained sidelined at Thursday's practice. Analysis: Fournette being ruled out for Sunday's game in London against the Eagles looks like a mere formality at this point. Once that's in the books, as expected, he'll presumably take aim at a possible return to action Nov. 11 against the Colts, following the Jaguars' Week 9 bye. In his anticipated absence, T.J. Yeldon and newcomer Carlos Hyde will be tasked with handling the team's Week 8 backfield duties. Fournette (hamstring) is not expected to participate in Thursday's practice. Fournette (hamstring) didn't practice Wednesday, as anticipated. Analysis: Fournette, who has missed the Jaguars' last three games and five of their last six is trending toward another inactive status Sunday against the Eagles. In such a scenario, he would rest straight through the team's Week 9 bye and perhaps target a return to action as soon as Week 10 in Indianapolis. For this weekend's contest in London, the Jaguars will likely turn to a combination of T.J. Yeldon and newcomer Carlos Hyde to handle the bulk of snaps at running back. Fournette (hamstring) isn't expected to participate in practice Wednesday. Fournette isn't expected to be available to play until Nov. 11 against the Colts due to his lingering hamstring injury, according to sources familiar with his situation, Adam Schefter of ESPN reports. The Jaguars could be targeting their Week 10 game against the Colts for Fournette's (hamstring) return to action. Hays Carlyon of 1010 AM WJXL Jacksonville reports. Fournette (hamstring) has been ruled out for Sunday's game against the Texans. Analysis: The Jaguars were hopeful Fournette might be able to return from a two-game absence in Week 7, but there was never much hope for that materializing after he failed to practice Wednesday through Friday. Fournette will now turn his focus to a potential comeback Week 8 against the Eagles. With Fournette sidelined again, T.J. Yeldon (foot/ankle) is in line to head the Jacksonville backfield, with Jamaal Charles on hand to work in a complementary role. Fournette (hamstring) worked out on the side during the media-access portion of Friday's practice, Daniel Popper of The Athletic reports. 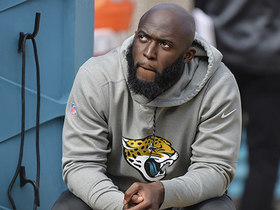 Analysis: The Jaguars were optimistic about Fournette's chances of returning to action earlier this week, but unless he gets some work in behind the scenes Friday, he'll go down as a non-participant for the third consecutive day. The Jaguars will provide more details regarding Fournette's status -- and that of backup T.J. Yeldon, who is dealing with an ankle injury -- when Friday's practice comes to a close. Fournette (hamstring) didn't practice Thursday. Fournette (hamstring) won't practice Wednesday, but coach Doug Marrone said the running back would attempt to get back on the field during Thursday's session, Andrew Siciliano of NFL Network reports. Fournette (hamstring) isn't expected to practice Wednesday. Analysis: Coach Doug Marrone had expressed optimism that Fournette would be able to shake off the hamstring injury and play Sunday against the Texans, but the running back's absence for the first practice of the week doesn't portend well for his eventual status. Fournette will have two more practice days to prove his condition has improved sufficiently enough for him to suit up in Week 7, but T.J. Yeldon (foot/ankle) tentatively looks on track to head the Jacksonville backfield for at least one more game. Coach Doug Marrone hopes Fournette (hamstring) will be available for Sunday's contest against the Texans, Michael DiRocco of ESPN.com reports. 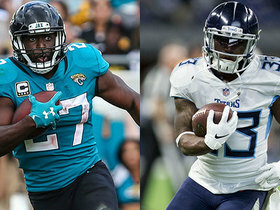 Though Fournette (hamstring) is out for Sunday's game against the Cowboys, coach Doug Marrone relayed Friday that the running back has a chance to play next week against the Texans, Michael DiRocco of ESPN.com reports. Analysis: While such an outcome is hardly a lock, Fournette was able to run on the side during Friday's light workout, so he's clearly trending in the right direction. There had been previous speculation that Fournette might be held out through the Jaguars' Week 9 bye, but if his hamstring responds well in the coming days, he could see action sooner. In the meantime, T.J. Yeldon is in line to head the team's backfield Week 6, with Jamaal Charles and David Williams in reserve. Fournette (hamstring), who has already been ruled out for Week 6, was spotted at Friday's practice with a helmet, Michael DiRocco of ESPN.com reports. Analysis: Fournette's presence at Friday's practice does not change his status for Sunday's game against the Cowboys, but DiRocco does suggest it's a sign that Fournette could be able to practice in some fashion next week. With Fournette (hamstring) having been ruled out for four of the Jaguars last five games, coach Doug Marrone relayed Wednesday that T.J. Yeldon will continue to "carry the load" Sunday against the Cowboys, John Oehser of Jacksonville's official site reports. Coach Doug Marrone announced that Fournette (hamstring) has been ruled out for Sunday's game against the Cowboys, John Reid of The Florida Times-Union reports. Fournette (hamstring) isn't expected to participate in Wednesday's practice, Daniel Popper of The Athletic reports. Fournette (hamstring) isn't expected to return for Week 6 against the Cowboys, Ian Rapoport of NFL Network reports. Fournette, who will miss Sunday's game against the Chiefs with a hamstring injury, could miss Week 6's game against the Cowboys as well, Ian Rapoport of NFL Network reports. Analysis: With the running back quickly ruled out this past week and his injury not progressing as fast as hoped, there's a chance that his absence will extend beyond Week 5. In that case, T.J. Yeldon would continue to serve as the Jaguars' top back, with Corey Grant slated to work as a complementary option. Coach Doug Marrone said Fournette (hamstring) has been ruled out for Sunday's game against the Chiefs, Jeff Darlington of ESPN reports. Fournette (hamstring) isn't expected to participate in Wednesday's practice. Coach Doug Marrone said Monday that he isn't sure how much time Fournette will need to recover from his latest aggravation of a hamstring injury, John Reid of The Florida Times-Union reports. Fournette was forced out of Sunday's game against the Jets with a hamstring injury. Analysis: Not optimal, since Fournette was listed as questionable for the contest with a hamstring issue. T.J. Yeldon and Corey Grant are slated to handed the team's backfield duties for the rest of Sunday's contest. Fournette (hamstring) is listed as active for Sunday's game against the Jets. Analysis: Friday uncertainly with regard to the running back's status turned into subsequent optimism and Fournette is now set to make his first game appearance since Week 1. In the absence of any setbacks Sunday, Fournette is in line to head the Jaguars' Week 4 running attack, with T.J. Yeldon and Corey Grant on hand to serve in complementary roles. Fournette (hamstring), who is listed as questionable for Sunday's game against the Jets, is expected to play in the contest, Adam Schefter of ESPN reports. Fournette (hamstring) tweeted that he's "happy to be back" for Sunday's game against the Jets; however, he later deleted the tweet, Michael David Smith of Pro Football Talk reports. Analysis: Fournette is officially listed as questionable, and the team has not provided an update since Friday's injury report. It looks like the team let Fournette know that he shouldn't be putting out more information about his injury than the Jaguars. So, Fournette seems to think he's playing, but we won't know for sure until Jacksonville announces its inactives for Sunday. Fournette (hamstring) is listed as questionable for Sunday's game against the Jets, John Oehser of the Jaguars' official site reports. Fournette (hamstring) took part in drills at Friday's practice, Daniel Popper of The Athletic reports. Analysis: It won't be clear until after practice how much work Fournette was able to get in Friday, but it's a good sign that he was on the practice field for the third day in a row. 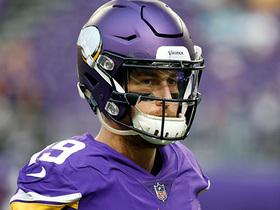 He has put himself in position to return to action Sunday against the Jets, and the Jaguars' final injury report of the week will reveal his chances of doing so. Fournette (hamstring) remained limited at practice Thursday. Analysis: Meanwhile, fellow running back T.J. Yeldon (ankle) returned to a limited practice Thursday. Given that Fournette was able to practice in a limited fashion all of last week, and that he's continued on that path both Wednesday and Thursday, he's trending in the right direction as Sunday's game against the Jets approaches. Friday's final injury report will reveal if he heads into that contest listed as questionable or minus a Week 4 injury designation. Fournette (hamstring) is expected to practice Thursday, Tad Dickman of Jaguars PR reports. Analysis: Fournette was able to practice on a limited basis Wednesday, and it appears he will do at least as much Thursday. He is putting himself on track to be available for Week 4, but his availability last week was not determined until Sunday, so it could still be several days until a decision is ultimately made. Fournette (hamstring) was a limited practice participant Wednesday, John Oehser of the Jaguars' official site reports. Analysis: Meanwhile, fellow running back T.J. Yeldon (ankle) missed practice. Given that Fournette was able to practice in a limited fashion all of last week, it's suspected that in the absence of any setbacks during team sessions Thursday and Friday, he'll be ready to return from a two-game absence Sunday against the Jets. Fournette (hamstring) is expected to practice Wednesday, Michael DiRocco of ESPN.com reports. 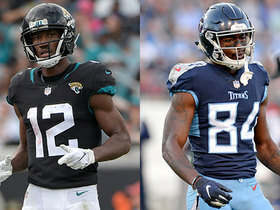 Coach Doug Marrone said Monday that he considers both Fournette (hamstring) and T.J. Yeldon (ankle) to be day-to-day, Michael DiRocco of ESPN.com reports. Analysis: Fournette seemed to be on track to play in Sunday's 9-6 loss to Tennessee after logging limited practices all last week, but he ultimately was held out in a game-time decision. Yeldon got the start and piled up 90 scrimmage yards on 13 touches while playing through his own injury, with Corey Grant chipping in just 10 yards on seven touches. The Jacksonville backfield will once again require close monitoring ahead of a Week 4 game against the Jets. Fournette (hamstring) is inactive for Sunday's game against the Titans. Analysis: Meanwhile, T.J. Yeldon (ankle) is in uniform for the contest and in line to head the Jaguars' rushing attack in Week 3, with Corey Grant in line to work in a change-of-pace/pass-catching role that could yield PPR dividends. Brandon Wilds is also on hand in a reserve capacity. Given that Fournette was able to practice in a limited fashion this past week, he would appear to have a solid chance to play in Week 4 against the Jets. 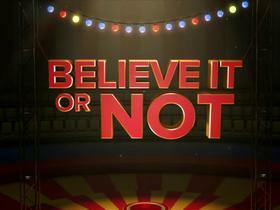 Fournette (hamstring), who is listed as questionable for Sunday's game against the Titans, is considered unlikely to play in the contest, league sources tell Adam Schefter of ESPN. Analysis: Schefter had previously reported late Saturday that Fournette was expected to be available in Week 3, but the Jaguars apparently had a change of heart overnight and intend to play it safe with their star running back for the second straight contest. T.J. Yeldon (ankle), meanwhile, is in line to suit up Sunday, according to Schefter, so he'll likely handle the bulk of the snaps out of the backfield. Corey Grant will also see an enhanced role on offense with Fournette sidelined. Fournette (hamstring), who is listed as questionable for Sunday's game against Tennessee, is likely to play, a source told Adam Schefter of ESPN. Analysis: Both fellow running back T.J. Yeldon (ankle) and Fournette at this stage appear to be trending in the right direction to play Sunday. However, this report isn't official so fantasy owners will want to watch Fournette's status before the Jaguars kick off at 1:00 PM ET on Sunday. Fournette (hamstring) will be listed as questionable for Sunday's game against the Titans, John Oehser of the Jaguars' official site reports. Analysis: The same applies to fellow running back T.J. Yeldon (ankle), but at this stage things appear to be trending in the right direction for Fournette with regard to his Week 3 status. In any case, the Jaguars kick off at 1:00 PM ET on Sunday, so Fournette's availability will be known before the first wave of NFL contests begin this weekend. According to Michael DiRocco of ESPN.com, Fournette (hamstring) "participated in every drill...during the media viewing portion of (Friday's) practice." Analysis: It won't be clear how much work Fournette got in until after Friday's practice comes to a close, but he was able to get in at least some work for the third day in a row. Fournette's injury status for Week 3 will be revealed when the Jaguars release their final injury report of the week around noon ET. Fournette (hamstring) remained limited at Thursday's practice, Jim Wyatt of the Titans' official site reports. Analysis: Fournette practiced on a limited basis Wednesday after not getting on the practice field at all last week, and it appears he will be able to at least turn in a limited session again Thursday. His Week 3 status will not be officially determined for at least another day, but he is trending in the right direction. Fournette (hamstring) was limited at practice Wednesday. Fournette (hamstring) is expected to practice Wednesday in some capacity. Fournette (hamstring) is inactive for Sunday's contest against the Patriots. Analysis: In Fournette's absence, T.J. Yeldon will head the Jacksonville backfield Sunday, with Corey Grant on hand to serve in a complementary role. Given that Fournette headed into the weekend in the game-time decision category, he would appear to have a decent chance to return to action next Sunday against the Titans. Fournette (hamstring) is not in line to play against the Patriots on Sunday, Adam Schefter of ESPN reports. Analysis: This will become official upon the release of the team's Week 2 inactives, but this nugget is enough to pull Fournette from fantasy lineup consideration. Though Fournette (hamstring) officially remains a game-time call for Sunday's contest against the Patriots, the Jaguars view him as unlikely to play, Adam Schefter of ESPN reports. Though coach Doug Marrone has expressed a degree of confidence with regard to Fournette's (hamstring) Week 2 status, he acknowledged that the running back's situation remains a possible game-time decision for Sunday's game against the Patriots, John Oehser of the Jaguars' official site reports. Fournette (hamstring) is officially listed as questionable for Sunday's game against the Patriots, Mike Kaye of FirstCoastNews.com reports. Analysis: Fournette was not spotted during the media-access portion of Friday's practice, but the running back previously noted that his status for Sunday's 4:25 ET kickoff against the Patriots would probably come down to a "game-time decision." If Fournette is limited or unable to go Week 2, T.J. Yeldon would get the start in his place. Analysis: It's possible Fournette could get some work in behind the scenes Friday, but it's looking like he will sit out for the third day in a row. Fournette is still hoping to be able to play Sunday against the Patriots, and the Jaguars' final injury report of the week will reveal whether or not he still has a chance to do so. If Fournette is unable to go Week 2, T.J. Yeldon would get the start in his place. Fournette (hamstring) said he expects his status for Sunday's contest against the Patriots to come down to a "game-time decision," Jeff Darlington of ESPN reports. "I started running on [the strained hamstring]," Fournette said Thursday. "It feels good. So that's progress. We'll see...I like my chances more and more as the day has gone on." Fournette (hamstring) isn't expected to practice Thursday. Analysis: Jaguars head coach Doug Marrone hinted Wednesday that Fournette could miss practice all week, so it comes as little surprise that the running back appears unlikely to get in any work for a second straight day. Regardless of Thursday's participation, though, Fournette should still have a decent chance to play Sunday against the Patriots. T.J. Yeldon would likely act as the Jaguars' top option out of the backfield if Fournette ends up being ruled out for the contest or is significantly limited. Jaguars head coach Doug Marrone acknowledged that Fournette (hamstring) could be withheld from all three of the team's practices this week and still play Sunday against the Patriots, Michael DiRocco of ESPN.com reports. Coach Doug Marrone said Fournette is considered "day-to-day" with a minor hamstring injury, Michael DiRocco of ESPN.com reports. Analysis: Marrone said it's too early in the week to determine whether Fournette will play in Sunday's game against the Patriots, but the fact that there's even a chance the running back could suit up is nonetheless great news for Fournette and his fantasy owners alike. We should get a better feel for the situation Wednesday when the Jaguars post their first injury report of the week. Coach Doug Marrone said Sunday that he's "pretty optimistic" about Fournette's hamstring injury, J.P. Shadrick of Jaguars.com reports. Fournette told Josina Anderson of ESPN that his hamstring is "good" and that he could have re-entered Sunday's 20-15 win over the Giants. Analysis: Fournette suggested that the team was "being cautious" by holding him out after he tweaked his hamstring Sunday. The running back's assessment of the situation is certainly promising, but we'll nonetheless monitor Fournette's status in advance of Week 2's game against the Patriots. Next in line for the Jaguars' carries in the event that Fournette's hamstring flares up again in the coming days is T.J. Yeldon. Fournette (hamstring) was ruled out of Sunday's game against the Giants, Daniel Popper of The Athletic reports. 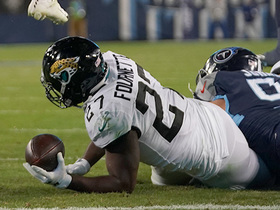 Analysis: Fournette went down in the first half with a hamstring injury, which was deemed severe enough to sideline him for the rest of the Jaguars' regular-season opener. If Sunday's backfield usage is any indication, T.J. Yeldon (10 touches at the start of the fourth quarter) would be the desired handcuff over Corey Grant (one touch) in the event Fournette misses time. Fournette was forced out of Sunday's game against the Giants with a hamstring injury. 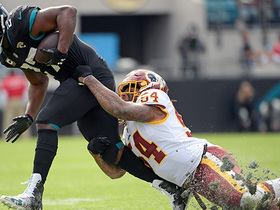 Analysis: As long as Fournette -- who is questionable to return to the game -- is out of action, the Jaguars will turn to T.J. Yeldon and Corey Grant to handle their rushing attack. Fournette took 10 carries for 57 yards and a touchdown and caught each of his three targets for 18 yards in Saturday's preseason win over Atlanta. Fournette carried eight times for 12 yards and a touchdown during Saturday's preseason contest against the Vikings. He also caught both his targets for 17 yards. Analysis: Fournette averaged just 2.9 yards per touch against a stout defensive unit, but he capped off a long touchdown drive with a one-yard plunge to start the second quarter. The big back will take on a massive load this season, so the team has taken it easy on him during training camp in order to preserve him. That said, he should see an increased responsibility next week against the Falcons. Fournette said he now weighs 223 pounds, Jeff Duncan of The New Orleans Times-Picayune reports. Fournette expects to enter training camp at 224 pounds, which is 11 pounds lighter than he was last season, John Reid of The Florida Times-Union reports. "I feel like I play my best at that weight -- 223, 224 -- that's what I played in college," the second-year running back said. "Why not? I don't want to be average. I want to be above average, be the greatest one to play this game. I feel lighter, quicker and I have a lot of my burst." 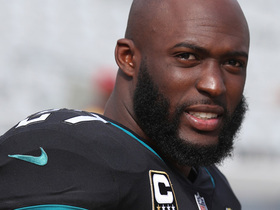 The Jaguars reinforced their commitment to Fournette and the running game with the offseason signing of left guard Andrew Norwell, ESPN.com's Michael DiRocco reports. Fournette ran for 76 yards and a touchdown on 24 carries while adding 13 yards on two catches during Sunday's 24-20 loss in New England. Fournette (ankle) does not carry an injury designation for Sunday's AFC championship game against the Patriots after logging limited practices all week. Fournette (ankle) was listed as a limited participant at Wednesday's practice. Fournette, who sprained his right ankle in Sunday's 45-42 divisional-round win over the Steelers, is expected to participate in practice Wednesday, Ian Rapoport of NFL Network reports. Fournette rushed 25 times for 109 yards and three touchdowns and brought in two of four targets for 10 yards in Sunday's 45-42 AFC divisional-round win over the Steelers. 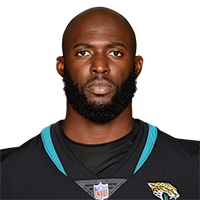 Fournette, who exited Sunday's playoff game against the Steelers in the second quarter with a right ankle injury, will be available for the second half of the contest, John Oehser of the Jaguars' official site reports. Analysis: This is huge news for the Jaguars, who started the half up by a score of 28-14, with two of the team's TDs having been scored by Fournette. With their starting running back available again, T.J. Yeldon is in line to revert to backup/complementary duty for the Jaguars. Fournette was forced out of Sunday's playoff game against the Steelers with a right ankle injury, John Oehser of the Jaguars' official site reports. Analysis: Prior to his second-quarter exit from the contest, Fournette had logged 12 carries for 82 yards and two TDs, as well as one catch for 10 yards. Next up for the team's carries is T.J. Yeldon, with Chris Ivory having been made inactive Sunday. Fournette rushed 21 times for 57 yards and brought in there of five targets for 21 yards in Sunday's 10-3 AFC wild-card win over the Bills. He also recovered a fumble. Analysis: Fournette found tough sledding on the ground against a Bills defense that had been porous against the run for most of the season. The standout rookie's longest run of the day was a modest 16 yards, leaving him with just 41 yards on his other 20 carries. Fournette will look to up his production in next Sunday's AFC divisional-round matchup against the Steelers, a team that he trampled for a career-high 181 yards and two touchdowns back in Week 5. Fournette rushed 19 times for 69 yards and brought in four of five targets for 67 yards in Sunday's 15-10 loss to the Titans. Analysis: Fournette's rushing tally allowed him to eclipse the 1,000-yard mark, and he also established a career high in receptions and receiving yardage in the process. The 2017 first-round pick only eclipsed 4.0 YPC in one game over his last five, although he did manage to find the end zone on three occasions over that span. The 22-year-old will undoubtedly be a focal point of the Jaguars' postseason aspirations, which begin in earnest in next Sunday afternoon's wild-card tilt against the Buffalo Bills. Jaguars head coach Doug Marrone suggested Fournette will play in Sunday's game against the Titans, even though Jacksonville can't move any higher or lower than the No. 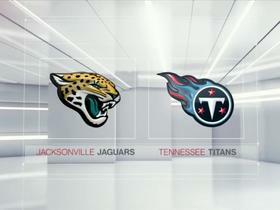 3 seed in the AFC, Jim Wyatt of the Titans' official site reports. Fournette ran for 48 yards and one touchdown on 18 carries against San Francisco on Sunday, adding three receptions for 22 yards on three targets. Analysis: Fournette couldn't pile up much yardage from scrimmage, but the 49ers run defense has been one of the best in the league of late, and the reality for the foreseeable future will be that Fournette sees stacked defensive fronts as defenses instead test their luck with Blake Bortles, whose three turnovers in this loss will only encourage a similar approach from the Titans in Week 17. Fournette's quadriceps injury appears to be a non-issue at this point, in any case. Fournette (quadriceps) was a full participant at Wednesday's practice. Analysis: Fournette's ability to log a full practice supports head coach Doug Marrone's assertion that the running back will return for Sunday's game in San Francisco after sitting out for a blowout win of the Texans in Week 15. The 49ers have limited opposing RBs to 3.9 yards per carry and six rushing touchdowns, but they've struggled to defend backs in the passing game and haven't had much luck in tough matchups against the likes of Ezekiel Elliott, Todd Gurley and Adrian Peterson. Jaguars head coach Doug Marrone said Wednesday that Fournette (quadriceps) will play in Sunday's game against the 49ers, Eric Branch of the San Francisco Chronicle reports. Analysis: Fournette was held out of practice last week and ended up missing Sunday's 45-7 win over the Texans, but he returned to practice Wednesday in at least a limited capacity. Another update should be available later Wednesday when the Jaguars release their injury report, at which point it will be known if Fournette was a full or limited participant. Either way, he's on track to return for a favorable matchup Sunday in San Francisco. Fournette (quadriceps) is expected to practice Wednesday, Mike Kaye of FirstCoastNews.com reports. Fournette (quad) is officially inactive for Sunday's game against the Texans. Analysis: With Fournette unavailable Sunday, Chris Ivory is expected to draw the start at running back in his place, with T.J. Yeldon also on track to see added work in the Jaguars' Week 15 backfield. While this is a hit to those whose fantasy playoff spots Fournette helped secure, it's believed that he won't miss time beyond Sunday's contest, which puts the 2017 first-rounder on track to return to action next weekend against the 49ers. Fournette (quadriceps) won't play Sunday against the Texans, a league source informed Chris Mortensen of ESPN. Fournette (quadriceps) isn't expected to play Sunday against the Texans, Michael DiRocco of ESPN.com reports. Fournette (quadriceps) is questionable for Sunday's game against the Texans, Hays Carlyon of 1010 AM WJXL reports. Analysis: Fournette didn't practice in any capacity this week, but he did say Thursday that he expects to play in Sunday's game. He also suggested that he would likely need to practice in some capacity Friday in order to make that happen, with his failure to actually do so leaving his availability for Week 15 in serious doubt. Chris Ivory and T.J. Yeldon likely will split snaps and touches if Fournette doesn't end up playing. Fournette (quadriceps) didn't take part in Friday's practice, Mike Kaye of FirstCoastNews.com reports. Analysis: Fournette said Thursday that he expects to play in Sunday's matchup with the Texans, but he hasn't practiced at all this week, which does not bode well for his chances of actually taking the field in Week 15. Those hoping to include Fournette in this week's fantasy lineups will want to have another option ready in case he can't go; in that scenario, Chris Ivory and T.J. Yeldon would both likely have sizable roles in the Jaguars' backfield. Fournette said that his quadriceps injury shouldn't prevent him from playing in Sunday's game against the Texans, Mike Kaye of FirstCoastNews.com reports. Fournette (quad) was not spotted at practice Thursday, Michael DiRocco of ESPN.com reports. Analysis: Fournette also missed Wednesday's practice, so his status will need to be tracked closely as Sunday's 1:00 ET kickoff against the Texans approaches. Next up for the Jaguars' carries in the event that Fournette is limited or out this weekend are Chris Ivory and T.J. Yeldon. Look for added clarity on Fournette's Week 15 availability to arrive no later than Friday, once the Jaguars submit their final injury report. Fournette (quad) did not practice Wednesday. Analysis: Fournette has been able to play through a right ankle issue of late, but he's now also dealing with a quad concern. His absence from practice Wednesday could well be precautionary, but that notion may not be solidified until Thursday, assuming Fournette returns to practice in some capacity. Fournette is not expected to practice Wednesday due to a quad injury. Analysis: Fournette was slowed by an ankle injury the last few weeks, but he is now dealing with a different setback heading into Week 15. The severity of his latest injury is uncertain, so it remains to be seen if it will have any effect on his availability for Sunday's matchup with the Texans. Chris Ivory and T.J. Yeldon would figure to share the carries in some fashion if it turns out Fournette's injured quad keeps him off the field Sunday. Fournette rushed 24 times for 101 yards and a touchdown and brought in four of six targets for 18 yards in Sunday's 30-24 win over the Seahawks. Fournette (ankle) rushed 20 times for 57 yards and a touchdown while adding three catches for 22 yards on four targets in Sunday's 30-10 win over the Colts. Analysis: Fournette found pay-dirt from five yards out early in the third quarter. He came up hobbling at the end of a second-and-goal run later in that frame, but stayed in the game and ultimately reached the 20-carry mark for the sixth time in 10 career games. While Fournette hasn't shown much explosiveness of late with just one touchdown and an average of 2.9 yards per carry over the past four weeks, his heavy usage makes the talented rookie a strong option moving forward nonetheless. Fournette (ankle) was a full participant at Wednesday's practice. Analysis: This marks Fournette's first full practice since Week 10, when he wasn't on the injury report at all. With his ankle apparently in better shape than it has been in quite some time, the powerful rookie should stay busy Sunday against Indianapolis, looking to bounce back from a 12-carry, 25-yard dud in Sunday's 27-24 loss to the Cardinals. Fournette had 12 carries for 25 yards and caught each of his three targets for 17 yards in Sunday's 27-24 loss to the Cardinals. Fournette (ankle) does not have a designation on the final injury report for Sunday's game in Arizona. Analysis: A limited participant at every practice this week, Fournette never seemed to be in any real danger of requiring an absence, after rumbling for 111 yards on 28 carries in Week 11 against a stingy Cleveland run defense. He draws a slightly better matchup Sunday, facing an Arizona defense that's limited opposing running backs to 3.6 yards per carry and 82.8 rushing yards per game. Fournette (ankle) was limited at practice Wednesday. Fournette (ankle) said he doesn't expect to be back at full health until the offseason, John Oehser of the Jaguars' official site reports. Fournette (ankle) carried 28 times for 111 yards and added seven yards on a pair of receptions during Sunday's 19-7 win over the Browns. Analysis: Fournette was listed as questionable with the ankle issue throughout the week, but he tied his season high in carries and exceeded 100 scrimmage yards for the fourth time in his last five games. Though he was stifled by the Chargers last time out, the bruising rookie appears to be reaching 100 percent capacity after dealing with various distractions of late, and his massive workload bodes well moving into next week's matchup with the Cardinals. Fournette (ankle) is active for Sunday's game against Cleveland, Chris Mortensen of ESPN reports. Analysis: Fournette was listed as questionable after limited practices Wednesday and Thursday and no participation Friday, and while he may be able to play Sunday, he is certainly not going to be 100 percent and may be a risky option for fantasy purposes. 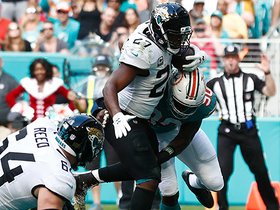 Given the issues, Chris Ivory and T.J. Yeldon could still see a limited increase in workload. Fournette (ankle) will be evaluated before Sunday's game against the Browns, but the team is optimistic he will play, according to Ian Rapoport of NFL Network. Analysis: Fournette is officially listed as questionable after limited practices Wednesday and Thursday and no participation Friday, and while he may be able to play Sunday, he is certainly not going to be 100 percent. Given the issues, Chris Ivory and T.J. Yeldon could see a limited increase in workload, which obviously takes touches away from Fournette. Fournette (ankle) is listed as questionable for Sunday's game against the Browns after not practicing Friday, Ryan O'Halloran of The Florida Times-Union reports. Fournette (ankle) didn't suit up for Friday's practice, Ryan O'Halloran of The Florida Times-Union reports. Analysis: Fournette was limited at the Jaguars' first two practices of the week while battling ongoing soreness from the ankle injury he first suffered Oct. 15 against the Rams, but it didn't seem to provide much cause for concern. However, his absence Friday firmly puts his availability for the Week 11 matchup with the Browns into question. Expect the Jaguars to provide more details regarding Fournette's status after Friday's practice comes to a close. Fournette (ankle) practiced on a limited basis Thursday. Fournette was limited at Wednesday's practice with an ankle injury, Nate Ulrich of the Akron Beacon Journal reports. Analysis: It's presumably the same injury that held Fournette out Week 7 against the Colts, though he wasn't listed on the injury report ahead of Sunday's 20-17 win over the Chargers. While there haven't been any media reports regarding a setback, Fournette's practice status will need to be monitored in the coming days as the Jaguars prepare for Sunday's matchup with a Cleveland defense that's allowing only 3.1 yards per carry and 86.4 rushing yards per game. Fournette rushed 17 times for 33 yards while catching two of four targets for 13 yards in Sunday's 20-17 overtime win over the Chargers. Analysis: A well-rested Fournette came in with massive expectations against a porous Los Angeles run defense, but was bottled up throughout. He managed just 21 yards on nine carries without a target in the first half and sat most of the second half with his team abandoning the run. Between getting scratched last week for a violation of team rules and this ugly performance, the standout rookie hasn't done his owners any favors of late. Fournette and Jaguars coach Doug Marrone both believe the running back is back on track ahead of Sunday's game against the Chargers, Ryan O'Halloran of The Florida Times-Union reports. Jaguars head coach Doug Marrone said he expects Fournette, who was inactive for Sunday's win over the Bengals for an "infraction of a team rule," to play Week 10 against the Chargers, John Oehser of the Jaguars' official site reports. Jaguars head coach Doug Marrone decided to make Fournette inactive for Sunday's game against the Bengals after the rookie missed some appointments recently, Ian Rapoport of NFL Network reports. Fournette is inactive for Sunday's game against the Bengals due to a violation of a team rule, Mike Kaye of FirstCoastNews.com reports. Analysis: The nature of Fournette's violation isn't known, but he'll sit out a second consecutive game as a result, after an ankle sprain prevented him from suiting up in the Jaguars' previous contest before their Week 8 bye. According to Adam Schefter of ESPN, Chris Ivory will garner the starting nod with Fournette out, but T.J. Yeldon should also receive liberal usage after logging 137 total yards on 11 touches in the Jaguars' Week 7 win over the Colts. Fournette (ankle) was listed as a full practice participant during Wednesday's session.